The Dinner before Thanksgiving is always an exercise in devising a menu that is somewhat light in anticipation of the excesses of Thanksgiving, and isn’t based around roasted chicken of any description. This year I decided early on that what I was craving was hominy, and I figured I’d make my standard Butternut Squash Chili which is light, un-Thankgiving-y, and involves hominy, plus is quick and easy to put together which fulfilled every requirement I had for a meal that week. A minor wrench was thrown in my plans when unexpectedly a friend’s husband was going to be able to come to Dinner because they were acquiring a babysitter in the form of a grandparent – the wrench was that he’s vegetarian (or, okay, kosher, but effectively vegetarian for my purposes). I initially regretfully said that wasn’t going to work, slept on it, hit myself upside the head and emailed to say I clearly shouldn’t talk after 9pm at night because I’m moronic. And with a week to think about it, cobbled together a recipe for a vegetarian chili that was easy, involved hominy, AND HAD PUMPKIN IN IT. Ahem, I’ve been feeling an unseasonal lack of pumpkin in my life lately. So really, the hitch in my carefully laid plans, was all to the good. Sometime as I was making Dinner I realized that I’d taken all the traditional flavors and ingredients of Thanksgiving and turned them inside out. 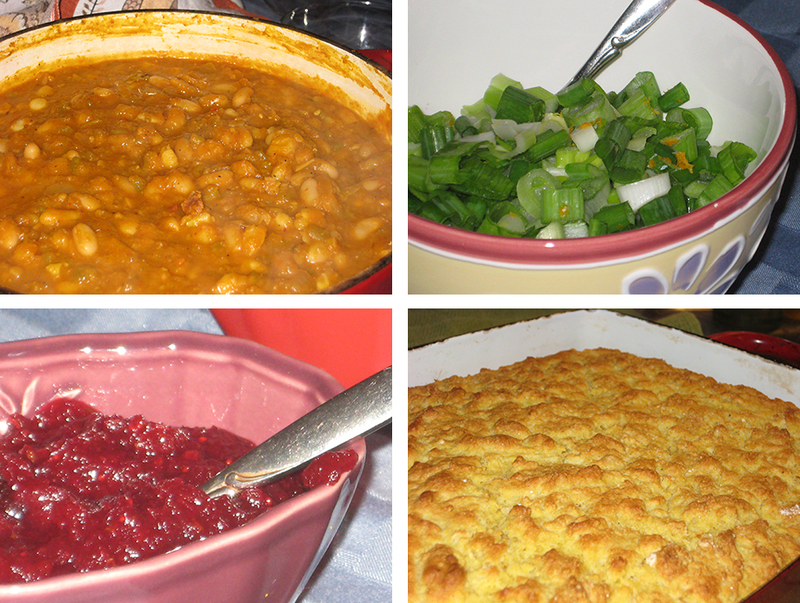 I got to wander around feeling very Top Chef with my deconstructed & reinvented Thanksgiving meal. The pumpkin from the pie was in the chili. 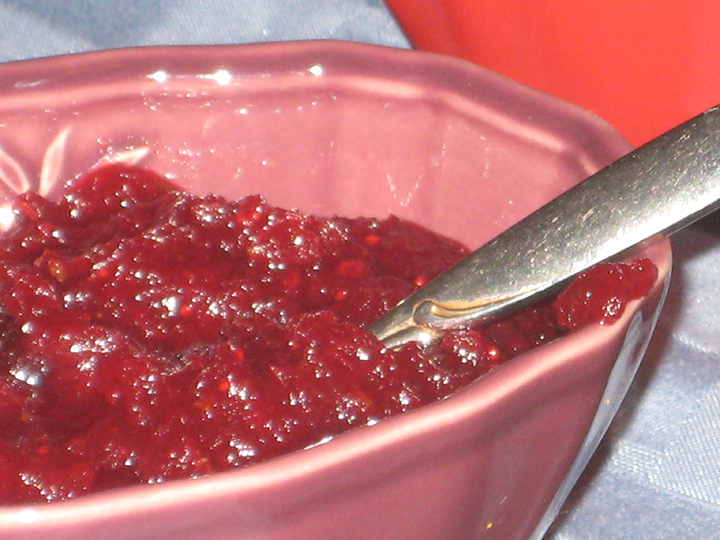 The cranberry sauce became jam. 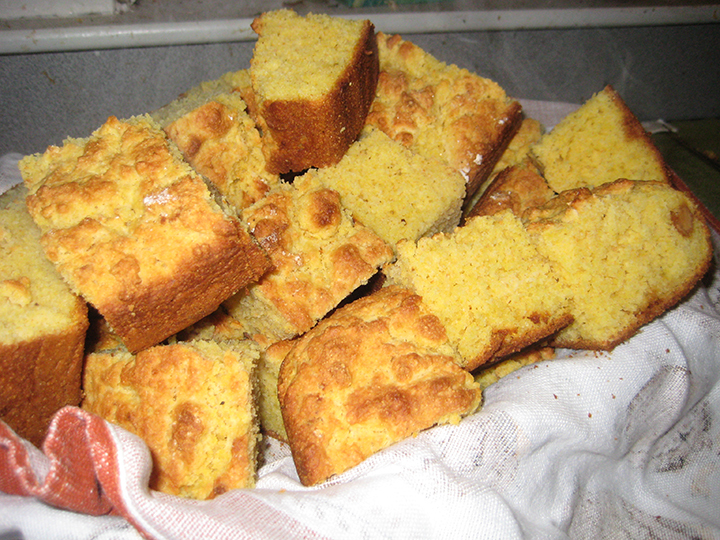 The cornbread stayed whole, rather than being crumbled into stuffing. If you wanted to go the whole nine-yards on this theme, you could substitute some of the white beans in the chili for shredded chicken. At least 90% of the genesis of this recipe was my craving for hominy. Puree one can of the drained & rinsed white beans with the water. Reserve. Saute onions in a little olive oil until softened and starting to brown. Add the garlic and saute for 30 seconds. Add spices/herbs and saute for 30 seconds to bloom the flavors. Stir in the green chilis, pumpkin puree, beer, pureed beans, and chicken/vegetable stock. Bring to a simmer. Add lentils & cook for 30 minutes. Whisk vigorously to break down the lentils. 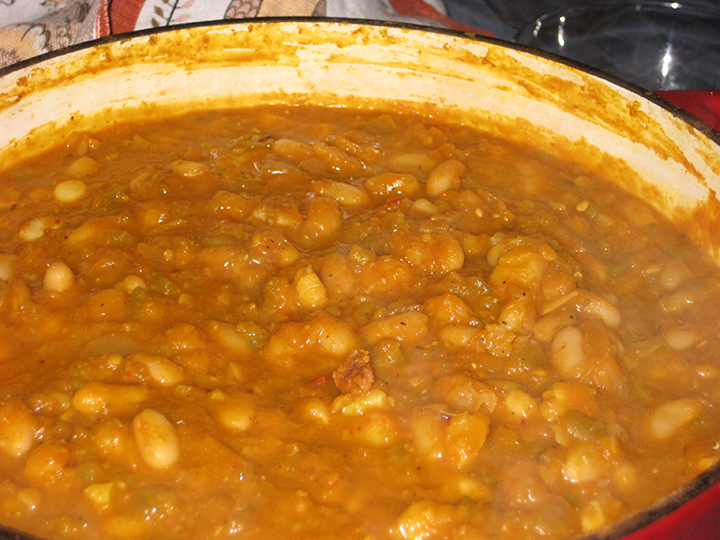 Add the remaining white beans and hominy and simmer for 20 minutes, or until thickened. Season to taste with salt/pepper/honey/hot sauce/lime juice. Serve with sliced scallions, grated cheddar cheese, and sour cream. Not quite as spicy as I envisioned, still tasty though. Combine everything in a heavy saucepan and bring to a boil. Cook until the cranberries pop – about 10-15 minutes. Coarsely puree with either an immersion blender (being careful of the very hot sticky liquid) or in a food processor. Return to the pot and continue to cook for another 15-20 minutes, or until very thick. Cool.